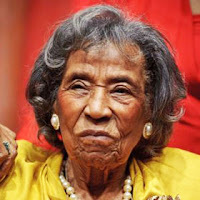 WASHINGTON, D.C. - Aug 26, 2015 — Congressional Black Caucus (CBC) Chairman G. K. Butterfield (NC-01) said on the passing of 104-year-old civil rights icon Amelia Boynton Robinson, "Today we mourn the passing of a remarkable citizen, Mrs. Amelia Boynton Robinson, a civil rights activist and one of the leaders of the 1965 Bloody Sunday march of 1965. Often referred to as the matriarch of our country's Civil Rights Movement, Mrs. Boynton Robinson worked tirelessly on the behalf of those who were discriminated against and disenfranchised, and she stood courageously in the fight to ensure voting rights for every citizen in this nation. Mrs. Boynton Robinson was committed to equality until her death and was a champion for African Americans when our voices were not yet heard. Fifty years ago, Mrs. Boynton Robinson walked bravely across the Edmund Pettus Bridge in Selma to ensure that all African Americans had equal opportunity and the right to vote. Her walk was not in vain, and we remain forever grateful for her contributions and dedicated service to civil rights in America."